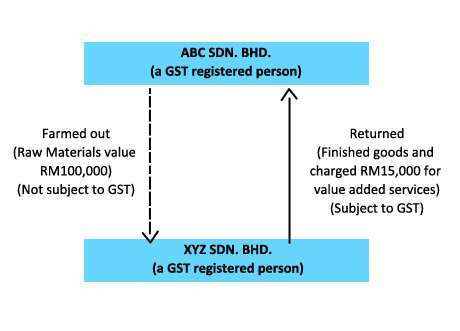 A manufacturer in Malaysia who is registered as a "registered person" is required to charge goods and services tax (GST) on taxable supplies that are standard-rated when the goods are sold to the customers. Manufacturers in Malaysia who make taxable supplies and have annual turnover which exceeds RM500,000.00 are liable to be a "registered person". Basically, all GST incurred by a manufacturer in Malaysia for his business purposes can be treated as his input tax. This input tax can be offset against any output tax received from customers. However, the input tax which incurred by a manufacturer in Malaysia for exempt supplies are not allowed to be offset against output tax and refund claimed. that are directly used for manufacturing of finished goods. such as rental of premises, water and electricity charges. Manufacturers who imports goods into Malaysia must be aware that all imported goods into Malaysia are subject to GST. Malaysia GST is computed based on transaction value including insurance and freight, all duties payables and other incidental charges. GST in Malaysia on imported goods needs to be declared in a specific customs declaration form and the tax must be paid at the point of entry. GST is generally payable before the goods are released from customs control. However, a registered manufacturer is able to recover the GST paid on imports by crediting the amount allowable against the output tax chargeable on the taxable supplies. Generally, all taxable supplies should accounted output tax except for zero-rated supplies. A manufacturer is liable to collect GST on taxable supplies from his local customers. Output tax collected from customers should be pay to custom after offset against input tax. In order to encourage export sector in Malaysia to be more competitive, all exports are treated as zero-rated supplies, which means that no output tax will be collected from overseas customers. Therefore, most manufacturers who are export-oriented would most likely have positive input tax refund. In certain manufacturing activities, it may be common practice for the principal manufacturer to outsource certain work to the sub-contractors for further processing. For GST treatment this is not a taxable supply for the principal as there was no transference of ownership of goods from the principal manufacturer to sub-contractor. Therefore, GST is no applicable in this matter. However, the sub-contractor would be charged GST output tax on the value of service supplied to principal. If you require for any further information regarding GST, please do not hesitate to contact our GST consultants at 03 - 9078 2868. We are pleased to help you in any difficulty regarding to GST.